Does your company wants to enter the Mexican market with your product? Maybe your company needs guidance to know where businesses are located in Mexico that want to buy and handle your products. Your company may have struggled to find distributors or has distributors but sales are not growing. Perhaps your company is already doing business in Mexico but sales are stagnant. Your company wants to expand its market but doesn't know where to go next. International business development is vital if your business wants to expand its market. No matter where your company is in the marketing cycle, you can get the expertise you want to enter the Mexican market and grow your business and profits. You may have heard stories about companies that spent tens of thousands, even millions of dollars to enter the Mexican market and then ran into one obstacle after another. Many closed up shop after suffering miserable sales and the lose of their investment in Mexico. So what's one of the biggest mistakes so devastating that it has caused even multi-national companies such as Microsoft and Wal-Mart to lose hundreds of millions of dollars? Not knowing the business culture is one of the key reasons U.S. companies struggle and fail internationally. This lack of knowledge can be very costly to businesses wanting to enter the Mexican market. Now imagine if your company could take action to help guarantee its success and save it from suffering the same enormous financial losses? 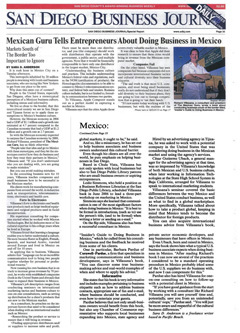 Companies such as Cisco Systems, National Drager, Comet AG and AT&T have come to Richard Villasana, known as The Mexico Guru, for help with their marketing to Mexico. These companies want an expert on Mexico and come to Richard to get the training and consulting they need to successfully market in Mexico. Under the guidance of Richard Villasana, his company has established distribution for the export of U.S. products in over twenty countries including Mexico, Australia, Ecuador, Morocco, Chile and Italy. in the next three to six month! Increase your company's profits beyond your U.S. market selling to Mexican customers. Quickly identify potential Mexican distributors and suppliers so you can generate revenue as soon as possible. Receive expert advice that will help you identify the best distributors and suppliers saving you hundreds of thousands of dollars in wasted time and money. Work with an expert on Mexico who has "been there, and still doing that" and who can help you avoid losing out on millions of dollars in missed business opportunities. Don't make the critical mistake of trying to enter the Mexican market alone. Our company can provide you with the resources and expert services you need to find the right businesses in Mexico, start generating revenue and have ongoing support as your company grows and expands in Mexico. Stuck and want someone you can rely on to get your project or marketing moving forward FAST? With our Mexico Consulting Service, get access to Richard Villasana, The Mexico Guru, so your company can have a solid marketing strategy to enter the Mexican market and start generating profits as soon as possible. Get access to experts who will locate reputable Mexican companies for you. The right Mexican company will generate sales and revenue while saving your company tens of thousands of dollars in wasted time, meetings and hidden difficulties down the road. 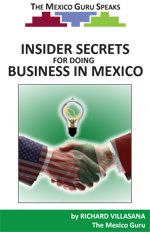 Discover little known, but powerful secrets to doing business in Mexico. The majority of U.S. companies enter the Mexican market with little or no knowledge of the business practices in Mexico. This weakness can cripple a company's efforts and cause the loss of tens of thousands, even millions of dollars in investment. To select the link below you feel is the most appropriate for your situation so you can get started right away to generate greater sales and accelerate your profits in Mexico. Have experts locate the right Mexican businesses for you. Click here. Have Richard Villasana, the Mexico Guru, help your company expand your market and accelerate your sales and profits in Mexico. Click here. I look forward to working together with you to help you achieve your goals in Mexico. Copyright © 2012-2014 Marketing To Mexico. All rights reserved. broadcast without the prior written permission of Marketing To Mexico.